Word for Word’s poetry tutor, Joan Michelson (a creative writing and literature lecturer at Birkbeck, University of London) is introducing us to the art of the ballad this term. As a starting point, we read “The Cruel Mother,” a traditional Scottish ballad. Joan stressed the need for us to have a story with a strong narrative, but she took the edge off the task by quoting the Argentinian writer Jorge Luis Borges who said that it is easier to work in a strict narrative because half of the work has already been done for you. Taking a cue from Borges, Joan suggested that we look in the newspaper, find a story, and hang our ballad on a ready-made narrative. But the word “ballad” seemed to throw the group. I could feel a subtle resistance in the room. It seemed to me that the group shied from the notion of having to control the meter and the rhyme. There may have been a time when I felt this way too, but now I feel that taking control of meter and rhyme just adds a game-element to the task at-hand. And the ballad is easy because the second and fourth line of every four-line stanza (quatrain) is a repeated chorus. So, in effect, you have only to create the first and third lines. The rhyme scheme is a, b, a, b, so that too is easy because the b’s are in place the entire length of the poem. One participant asked about finding the meter and apparently Joan did not hear the question. Finding the meter is easy. Write your first line. Underline all the polysyllabic words. If there is more than one, choose your favorite. Where does the accent fall on the polysyllabic word? When writing iambic, the very first word or syllable must be unstressed. If the first word is just one syllable, you are in luck because all one syllable words can be either stressed or unstressed. From that first unstressed word or syllable, you can work your way towards the first polysyllabic word which will fit the pattern or not. If it does not fit the pattern, you will have to move that word or choose another word that does fit the pattern. For example: a demonstration line: As a / small child / she stud / ied dance. The polysyllabic word is “studied,”and the stress falls on the first syllable. Moving to the left, you can impose a pattern of stresses on the words that come before. In this case, you would need to make no changes because you have only monosyllabic words that can take any stress you give them. If you have more than one polysyllabic word, you will have to play with your word choices until you achieve the iambic pattern. If writing to a set meter is new to you, do not attempt to rhyme anything or even write a coherent piece. Just play with writing sentences that demonstrate an iambic pattern. Should this seems too onerous – go back a few steps. If you are new to meter, practice first with syllabic verse. Find my October 21 blog which concerns writing syllabic verse and then go on to October 23 which deals with Haiku. If you are experienced with writing to meter, find a story in the newspaper: wife loves dog; husband and wife fight; wife finds her dog dead in the garbage. Something along those lines is ripe for a ballad. And don’t be compulsive about the meter. Ballads are set to music, and what may be off-meter when read, may sound just fine when glossed over with musical phrasing. I think some of my more cosmopolitan friends feel that I am spending too much of my London time reading and writing when I could be out experiencing the city. In my defense, I answer, I do see London, but I see it in snapshots as I walk here and there. Sunday I walked from Bayswater to Hatchards to buy some books, and on the way I had two encounters of the art kind – neither of which was in a gallery. The first installation that caught my eye was “Vroom Vroom” by Lorenzo Quinn (who incidentally is the son of the late actor/artist Anthony Quinn). 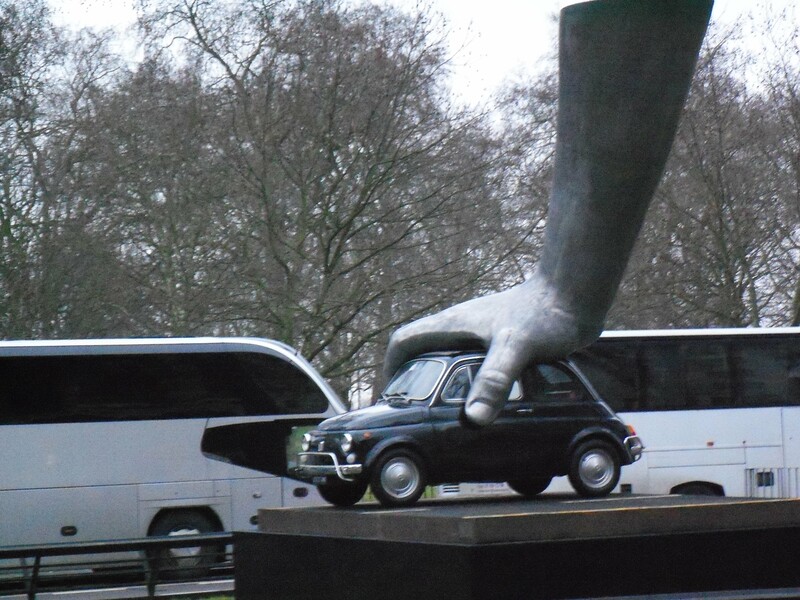 Smack dab on the south end of the Park Lane median strip was this Fiat 500 held by an outsized aluminium child’s hand. The Fiat is the same as the very first car that Quinn bought with his own money. Inspiration came to Quinn as he was watching his four-year-old son play with his toy cars. In Quinn’s words: “The sculpture represents the innocence and excitement about the little things that make us happy.” This sculpture made me happy. The second art work that caught my eye was in the windows of Fortnum & Mason’s. Every window had a 3-D display representing a famous work of art. Canaletto caught my eye because I had just missed a major London exhibition of his Venice-based paintings. 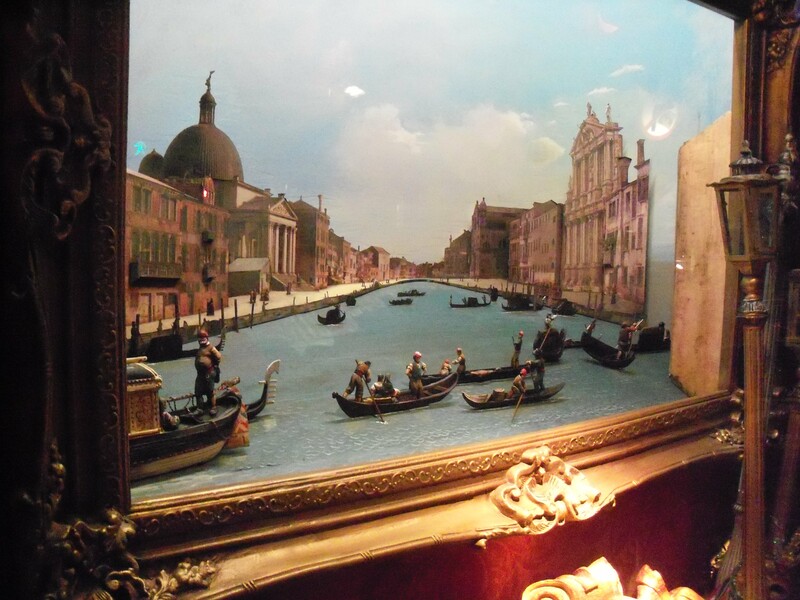 “A Regatta on the Grand Canal” was the perfect catch-up. Obviously, Fortnum & Mason’s window-dressers have more talent than just dressing windows. It is just north of Hyde Park Corner – opposite the Dorchester. Type Lorenzo Quinn + Vroom Vroom into your search engine for more pictures.